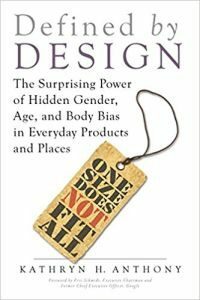 Kathryn H. Anthony’s book, ‘Defined By Design’, tells a lot more in its sub-title ‘The Surprising Power Of Hidden Gender, Age And Body Bias In Everyday Products And Places’. In other words, the poorly made everyday products you have or might have owned and had or your children have had serious and often fatal problems with. When you see the number of deaths in the USA associated with young children swallowing small magnets or batteries let alone lead paint, you will want to read this book, no matter where you live in the world. You should also get worried when it also applies to adult equipment as well. I should point out these problems are associated with American made products. In the UK, we have a similar problem but it tends to come from the East that tends to export illegal imports posing as our products a lot of the time. Even so, the sentiments are the same. There is no regard to the dangers to children, let alone adults, who accepts them without knowing the possible dangers. UK agencies do get after such products and I was amazed how far behind the USA is in doing so themselves but, when they do, the companies are forced to withdraw and refund those who’ve bought these products. As you read this book, you are going to feel angry if you still own such products. From the sounds of things, because so many people filled in the various guarantees, the companies know who own these dangerous items but I would have to wonder about people who didn’t sign them. Something that quickly becomes apparent from continued reading is very few manufacturers take into account the various heights and weights, let alone those with some form or invalid problems in their designs, let alone take into people’s needs for flexibility. Anthony’s design of a variable height podium actually became a demand when various people heard about it. Having a flexible design should surely be seen as the means to get the most sales. Thinking about it, I can’t help wonder if manufacturers get caught in their own self image and don’t see beyond that for normality. From the examples given in this book, that also seems to be true. The chapter on toilet facilities highlights a world-wide problem of there never being enough cubicles for women. I think Anthony would be upset to find that in the UK, because of the recession, many towns have cut back or closed public lavatories because they can’t afford them, telling people to seek out shop toilets. Looking at the photo section and the one where a museum has a glass ceiling to enable people to look down at exhibits but unfortunately also enabling people to look up women’s skirts, did give me a simple solution. Darken the ceiling room, much like how police officers do so they can look into an interrogation room, and the problem should go away. Considering the money orientation in America, any enterprising firm should recognise from this book by making their shops or offices more user friendly to different heights and disabilities that they will attract more customers and clients and ultimately make more money, especially if they stay ahead of their competitors. Speaking of money, Anthony reminded me of a problem I heard of a few years back in that there is no difference in the size of a dollar bill to any of the other amounts in paper money. Just so I don’t discriminate across the world, put an assortment on the table and shuffle then with your eyes closed and put them in the right order. We British have our paper in different sizes and coming up textures which makes ours very easy to tell apart. Anthony makes a very telling point about instructions with medicines being tiny print. All right, you might read in the middle of the day but in the middle of the night and half asleep you probably could get things wrong. Now that is something that really needs to be changed world-wide. Don’t think Anthony is criticising everything as there are many occasions where she points out improvements that are taking place. There are some hospitals in the USA that now have elderly patients emergency rooms which are made to be a lot more calmer for OAPs that should catch on, depending on staff availability. One area that Anthony didn’t discuss is women’s clothes. I bet it was a man who came up with the idea of the zip up the back of a dress and the near impossible contortions to get it right to the top unaided. You do come away from this book thinking which is no mean thing. At the end of the book, Anthony points out the ways to check on safety for your children and even yourselves. This book is certainly an eye-opener and will have you looking around and wondering at how people have gotten used to such a state of affairs. Don’t forget the effect of a combined protest when you see something that should be improved.